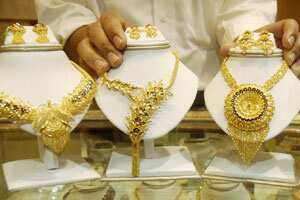 New Delhi: Gold slipped from its previous record on Thursday by losing Rs85 to Rs29,355 per 10 grams, due to reduced offtake by stockists and retailers at existing higher levels amid a weakening global trend. Silver also fell by Rs400 to Rs57,500 per kg on lack of buying support from industrial units. Trading sentiments turned bearish as retail customers refrained from purchasing gold at prevailing higher levels and weakening global trend as declines in equities may spur sales of the metal. Gold in global markets, which normally sets the price trend on the domestic front, dropped by 0.1% to $1,762.88 an ounce in London. On the domestic front, gold of 99.9 and 99.5% purity declined by Rs85 each to Rs29,355 and Rs29,215 per 10 grams, respectively. However, sovereigns were enquired at previous level of Rs23,300 per piece of eight grams in limited deals. Similarly, silver ready fell by Rs400 to Rs57,500 per kg and weekly-based delivery by Rs530 to Rs57,205 per kg. Silver coins continued to be asked at last level of Rs65,000 for buying and Rs66,000 for selling of 100 pieces.